Patrician, or 'Spoke' as collectors have been calling it for years, was made by Federal Glass Company from 1933 to 1939. Offered here is the lid for the cookie jar in excellent condition. See my other listings for more in this pattern. Patrician, or 'Spoke' as collectors have been calling it for years, was made by Federal Glass Company from 1933 to 1939. 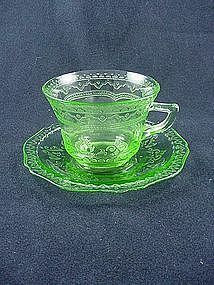 Offered here is the cup & saucer set in green in excellent condition. I have 2 available, price is per cup & saucer set. Green Patrician is hard to find, so grab these while you can! See my other listings for more in this pattern. 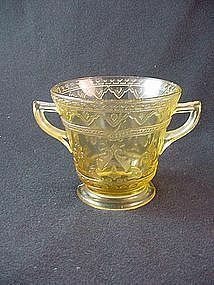 Patrician, or 'Spoke' as collectors have been calling it for years, was made by Federal Glass Company from 1933 to 1939. 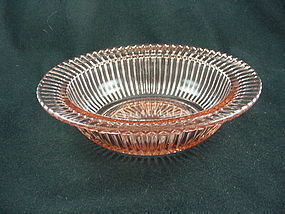 Offered here are the amber footed sherbet dishes in perfect condition. I have 2 available, price is per sherbet. See my other listings for more in this pattern. 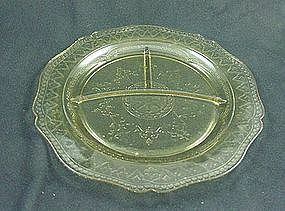 Patrician, or 'Spoke' as collectors have been calling it for years, was made by Federal Glass Company from 1933 to 1939. Offered here is the 11 inch grill plate in amber in excellent condition. I have 4 available, price is per plate. See my other listings for more in this pattern. 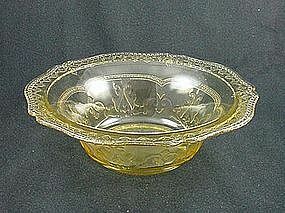 Patrician, or 'Spoke' as collectors have been calling it for years, was made by Federal Glass Company from 1933 to 1939. 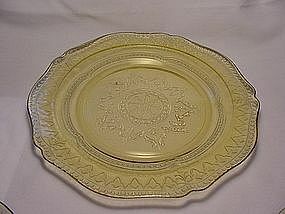 Offered here is the 9 inch luncheon plate in excellent condition. See my other listings for more in this pattern. 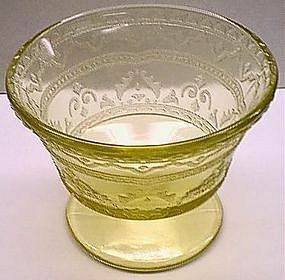 Patrician, or 'Spoke' as collectors have been calling it for years, was made by Federal Glass Company from 1933 to 1939. 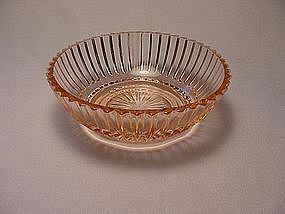 Offered here is the 8 1/2 inch round serving bowl in amber in excellent condition. See my other listings for more in this pattern. 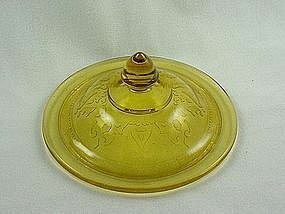 Patrician, or 'Spoke' as collectors have been calling it for years, was made by Federal Glass Company from 1933 to 1939. Offered here is the sugar bowl in perfect condition. See my other listings for more in this pattern. Petalware was produced by MacBeth-Evans Company in the 1930's. The red floral decoration is known as 'Florette'. 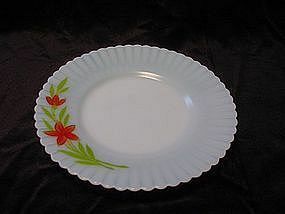 Offered here is the 8 inch salad plate in perfect condition. I have 2 available, price is per plate. See my other listings for matching pieces to complete your table setting. Petalware was produced by MacBeth-Evans Company in the 1930's. The red floral decoration is known as 'Florette'. 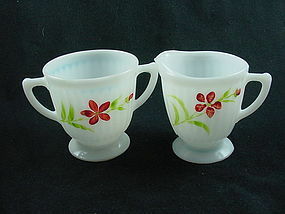 Offered here is the sugar & creamer set in perfect condition. Price is for the 2 piece set. See my other listings for matching pieces to complete your table setting. 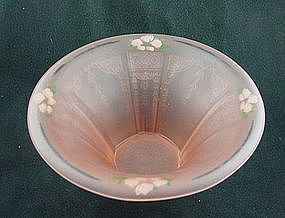 Petalware was produced by MacBeth-Evans Company in the 1930's. 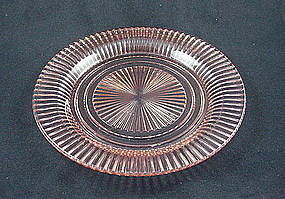 Offered here is the 8 inch salad plate in pink in excellent condition. I have 6 available, price is per plate. See my other listings for more in this pattern. This ashtray is my one and only piece of Phoenix Glass - and what a wonderful item it is! This is the #263 Phlox pattern ashtray in the Sculptured Crystal treatment. (crystal glass with a blue ceramic wash applied.) 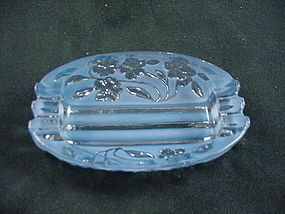 The ashtray is the 5 1/2 inch size - the larger and much harder to find of the two sizes that were made in this pattern. Produced in 1938, it's a rare find indeed! Excellent condition. Pillar Optic was made by Hocking Glass from 1937 to 1942. The pattern was limited to barware and a very basic luncheon setting. 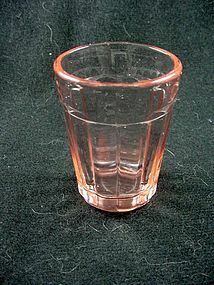 Offered here is the 2 1/4 inch whiskey tumbler (shot glass)in pink in excellent condition. I have 4 available, price is per glass. See my other listings for more in this pattern. 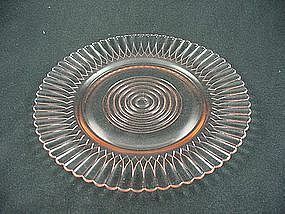 Princess is another of Hocking's very popular Depression Glass patterns. It was produced from 1931 to 1934 and is very much in demand today. 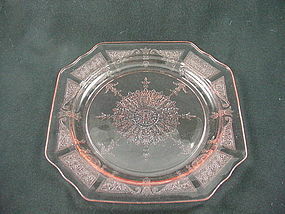 Offered here is the 8 1/4 inch luncheon or salad plate in pink in excellent condition. See my other listings for more in this pattern. Queen Mary was produced by Hocking Glass Company from 1936 to 1939. Offered here is the 9 3/4 inch dinner plate in pink. Excellent condition, I have 5 available. Price is per plate. These are hard to find so grab them while you can! See my other listings for more in this pattern. Queen Mary was produced by Hocking Glass Company from 1936 to 1939. 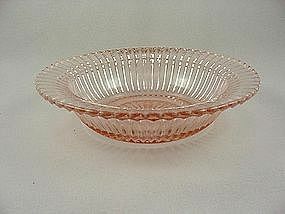 Offered here is the 6 inch rimmed cereal bowl in pink. Excellent condition, I have 12 available. Price is per bowl. See my other listings for more in this pattern. Queen Mary was produced by Hocking Glass Company from 1936 to 1939. Offered here is the 7 1/2 inch rimmed soup bowl in pink. Excellent condition, see my other listings for more in this pattern. Queen Mary was produced by Hocking Glass Company from 1936 to 1939. Offered here is the 4 inch berry bowl in pink. Excellent condition, I have 6 available. Price is per bowl. See my other listings for more in this pattern.